Registration on the One Biosecurity online tool will be voluntary but ALL of South Australia’s sheep, beef and dairy cattle producers are encouraged to register. Once registered, producers will be able to quickly generate a government and industry endorsed biosecurity plan for their property. This can be downloaded and used for any program that requires a farm biosecurity plan. The first release of the One Biosecurity program is for the sheep, beef cattle and dairy cattle industries and registration is now open. Why do we need One Biosecurity? One Biosecurity will help safeguard and promote the State’s $5.5 billion livestock sector. It will assist South Australian livestock producers to make safer, more informed livestock purchasing decisions that will better protect their livestock and livelihood. Agents, buyers and abattoirs can also register and use the One Biosecurity online tool to make credible and transparent checks. Details about good biosecurity practices and animal health management will be openly available before and at point of purchase. One Biosecurity will help address the growing challenges of increased consumer demand for product traceability. How will One Biosecurity work? 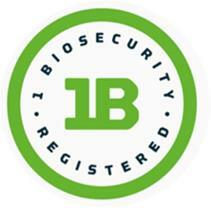 One Biosecurity will feature a free, easy-to-use website allowing livestock producers to register, manage and declare their farm biosecurity status online. This one-stop, online animal biosecurity management tool will provide best practice biosecurity assessment, management, advice and guidelines for multiple livestock diseases in South Australia. Producers who complete a successful One Biosecurity registration will be able to print and/or make available an online summary of their status to use when selling, buying or promoting their livestock.